It is far from over. Expect October Surprises, November Surprises, and the unprecedented. With one week left in the most chaotic and dangerous presidential contest in American history, the Hillary Rodham Clinton campaign is damaged and sinking. Even the propaganda protection of the Clinton-controlled mainstream corporate media is starting to buckle. Hillary Clinton is being bombshelled on a daily basis by hacker whistleblowers led by Wikileaks. Companion sites such as Most Damning Wikileaks, which sorts the raw data and provides analysis, have also been in overdrive. Countless Web/social media-based investigators, journalists and activists (Anonymous, DC Leaks, Guccifer 2.0, Michael Trimm, H.A. Goodman, Styxhexenhammer666, and anonymous posters at 4Chan, to name just a few), Project Veritas, Judicial Watch, and surging populist forces behind Donald Trump, are exposing the Clinton machine from every angle. There are still more bombshells to come. Now the FBI has opened two new investigations into Hillary Clinton’s emails. The most recent Wikileaks exposures provide clear evidence that Hillary Clinton and her team of aides and operatives knowingly used unencrypted private computers to conduct secret business (including exchanging classified information), knowingly tried to hide and destroy evidence of this activity, and were involved in an active cover-up. Emails of Clinton associate Cheryl Mills also implicate President Barack Obama. Obama not only knew about Clinton’s private server, he knowingly communicated with Clinton via this private server. It is believed that the overwhelming amount of significant evidence compelled the FBI to act. At the center of it all is top Clinton aide Huma Abedin. The FBI has found some 650,000 emails on the computers and devices of Abedin and her estranged husband, former congressman Anthony Weiner. 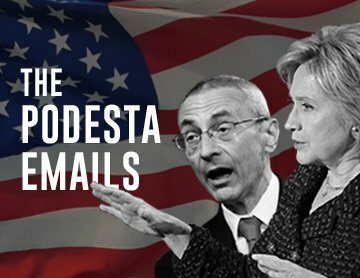 The classified Clinton-related emails were a surprise discovery made in the course of FBI’s investigation into Weiner’s pedophilia case. The Department of Justice has obtained warrant to search multiple Abedin/Weiner computers. What the new stash contains is being sorted out and catalogued by the FBI. The sheer number of surprise new emails raises questions all by itself. What exactly were Hillary and her team trying to hide? Was Clinton running secret operations, with Obama’s knowledge and participation, via private devices? If so, what were these secret operations? Was it to hide “shadow government” foreign policy, and “off the books” activities? Or was it about hiding the criminal activities of the Clinton Foundation, which has already been exposed by Wikileaks as a (very Iran-Contra) front for the covert funding of terrorists (including ISIS, via Saudi Arabia and Qatar), influence peddling, pay-for-play schemes, money laundering, fraud, weapons deals, and other crimes? Was it to hide personal depravity along the lines of pedophilia and connections to a larger Washington pedophilia ring? Will the new investigation go beyond the violation of security procedures, to the issue of criminal intent, as well as the evidence of crimes contained in the emails themselves? Both FBI Director James Comey and Attorney General Loretta Lynch (right) are compromised individuals with deep ties to the Clintons. Why did Comey take action at this time? Lynch was pressured or blackmailed by Bill Clinton to stop the initial investigation of Hillary, but did not, or could not, stand in the way of this round. President Obama has adopted a “neutral” stance. Obama has also stopped campaigning for or with Hillary. There is so much damning evidence that new probes had to be opened, according to the Hatch Act, which would make it a crime for Comey not to take action. So much that not even Comey/Lynch/Obama can cover for Hillary any longer. Serious internal pressure within the FBI itself caused Comey to do his job, or face a mutiny. Many FBI agents were furious about how Comey let Clinton off the hook the first time. Comey is now “covering his rear end”. Clinton’s campaign is damaged, possibly beyond repair. “Rats are jumping off the sinking ship”. The Democratic establishment may be forced to consider a backup plan to replace Clinton (with Tim Kaine) or cancel the election by some other means. Now that his own security-breaching communications with Clinton via her private server have been exposed by Wikileaks, Obama is distancing himself from Clinton, a major blow to Hillary’s campaign. Some skeptical observers have proposed that the FBI investigation could be a smokescreen diversion, a distraction from more potentially damaging, game-ending material expected to be released by Wikileaks and other sources in the coming week. However, it does appear that the actual “smoking guns” are so numerous and blatant, that the Clintons are in real trouble. The Democratic Party establishment is in panic mode. They have resorted again to blaming Russia. Comey is being attacked as a Russian agent. Comey (left) has now become as much of a target as Trump, who continues to be accused of being a Russian spy. The weak and empty response by an already weakened Hillary and the Democratic Party leadership is a sure sign that the election could very well be lost. In the Watergate scandal, Nixon’s surrogates took the fall, and Gerald Ford pardoned him. In Iran-Contra, numerous operatives “fell on the sword” to protect the Bushes and the CIA. What fate awaits Hillary Clinton? Will Hillary’s operatives (Huma Abedin, Cheryl Mills, Neara Tanden, John Podesta, Bob Creamer, etc.) protect her, or turn on her? Who will be left to protect her? Saudi-born (Muslim Brotherhood-connected) Huma Abedin, perhaps the key figure in the case, has asked for immunity. If Abedin tells the truth, she could destroy the Clintons, and be in danger for the rest of her life. Abedin, Hillary Clinton’s most personal aide, has been missing, not been seen with Hillary or the campaign in days. On the other hand, it would not be surprising if Abedin resorts to pleading the Fifth, or the favorite technique used by the guilty: repeatedly saying “I don’t recall”. Huma has already suggested she had “no idea” how the emails wound up on her computer. It seems that some of the incriminating documents are contained in a file titled “Life Insurance”. This suggests that Abedin stashed incriminating material for insurance in the event that the Clintons threatened her life. Weiner, however, is a different matter. He is not beholden to the Clintons, and could be more inclined to “sing”. The incendiary warfare for this election, and the control of the US government is all happening without the knowledge of the large segment of the ambivalent/ignorant population that relies exclusively on mainstream (Clinton-dominated) corporate media. The war for information is being fought entirely on the Web and, as exemplified by the Clinton scandals, the battle is over the contents of computer data. Corporate broadcast and print media has not covered much of the action at all. Within the corporate media bubble, Hillary still retains a lead, Trump is still a pervert and a madman, and the FBI is on a puzzling witch hunt. But even this bubble is beginning to burst. Hillary is in so much trouble, that even the corporate media is starting to be forced to report. There is a strong possibility that this election will be fought and decided without the participation of this left-out segment. These people will be shocked, surprised and baffled by it all. There is not much time left to get them to begin to understand. Hillary Clinton and her campaign have been severely damaged by resistance from all sides. According to conditions on the ground, and according to a growing number of the more accurate national polls, Trump is surging. He may even have a significant lead. However, the election has already been rigged and stolen for a Clinton victory. They have the means, the technology, and it is already happening. The question now is whether the FBI investigation, and last minute bombshells from Wikileaks, completely changes the landscape in the remaining days. This conflict will last well beyond the election and its result. Nixon won the presidential election in 1972 in a landslide, but was forced to leave office because of Watergate. Even if Clinton gets her way, she will be also be scandalized and investigated a la Nixon. A constitutional crisis is virtually guaranteed. She could be indicted before or after taking office. She could be pardoned by Obama. She could be impeached. In the unlikely event that she survives all of that, resistance to her will be never-ending. She is so corrupt, and has antagonized so many people and nations, that will not be able to govern or conduct diplomacy in any case. In the short term, the possibility of a major false flag event to distract from, and cancel election, remains the biggest and most terrifying scenario. And/or a martial law crackdown on the US in the event of civil unrest caused by a contested election. More bombshells, possibly the biggest ones yet, have been promised for the final weeks and days, including more Wikileaks, more from Project Veritas, more from Anonymous.